More than almost any other sport, golf has an annoying tendency to look much simpler than it is. Every golfer knows what it is to feel like you’re swinging like Jordan Spieth, then watch your ball fall nowhere near your target. As it turns out, perfect golf technique isn’t always obvious or intuitive. The good news is that human nature tends to be fairly consistent for everyone… at least when it comes to golf. Amateur golfers all tend to adopt the same bad habits. As a result, I can probably guess many of the mistakes you’re making right now in your own game. I can also help you fix them. I am going to share the five concepts every beginner golfers should know. These tips will drastically improve your game. In fact, the issues I’m going to address are so common that the advice I’m going to give you makes up about 90% of the golf lessons I give. You’ll be ready to take over my job by the time we’re done here. I’m going to help you recognize the mistakes you may be making in each of these areas, how to fix them, and why it matters. Finally, I’ll teach you a bonus drill that ties all these concepts together. You will have the tools to put these tips into practice and start lowering those scores. In fact, take a look at these 5 Golf Tips for Beginner Golfers once you finish to keep the learning going. 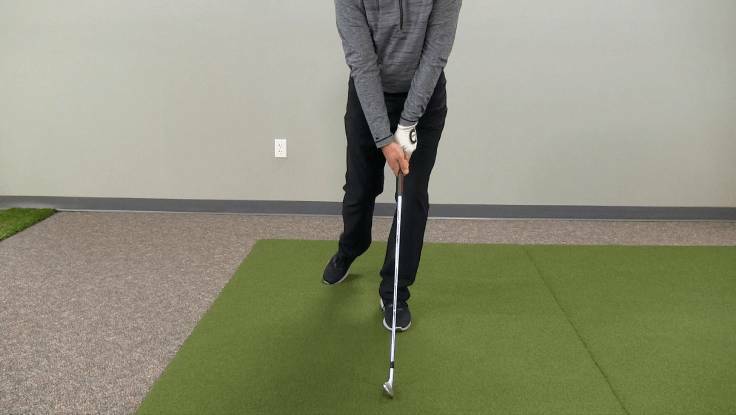 These tips range from Driving down to putting, helping you round out your entire golf game. Many beginners inhibit their swing by positioning the club shaft in the palm of their hand. This instinct makes sense. Typically, if you want to get a good grip on something, you’re going to center it in your palm, right? 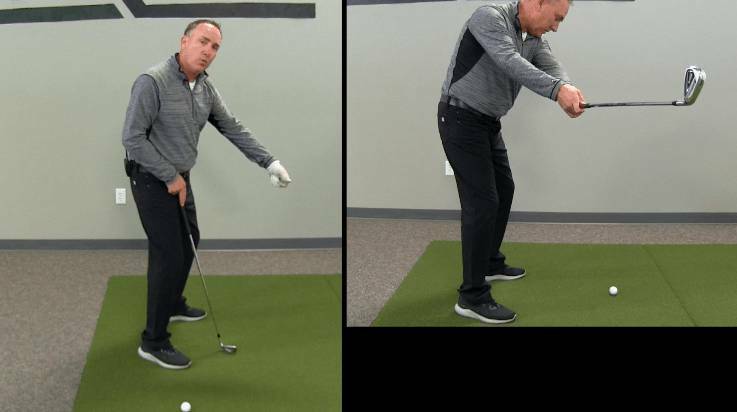 Unfortunately, it is this exact instinct that prevents many amateur golfers from getting the leverage they need in their swing. Granted, this is not an intuitive way to grab anything you intend to swing with force. You’ll just have to trust me on this, though. When setting up your grip, start by placing the upper part of your club shaft against the pinky-side pad of your lead hand. (If you’re right handed, your “lead hand” is your left hand, and vice versa.) Then place the shaft across the hand so it exits your grip through middle of your index finger. Can you feel the difference? You are now gripping the club in your fingers, rather than in your palm. 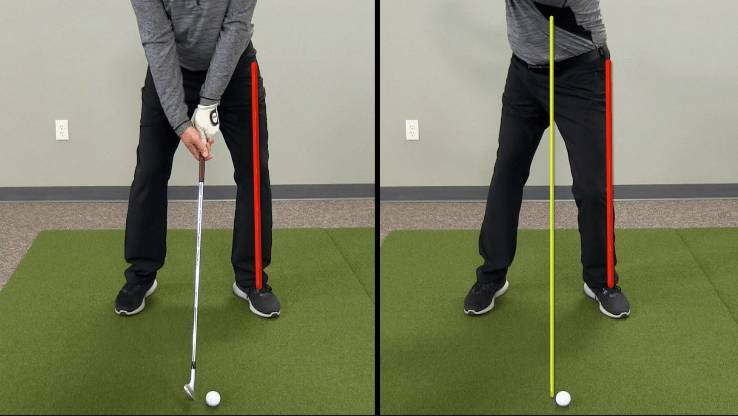 This will give you more leverage and help you increase your clubhead speed. 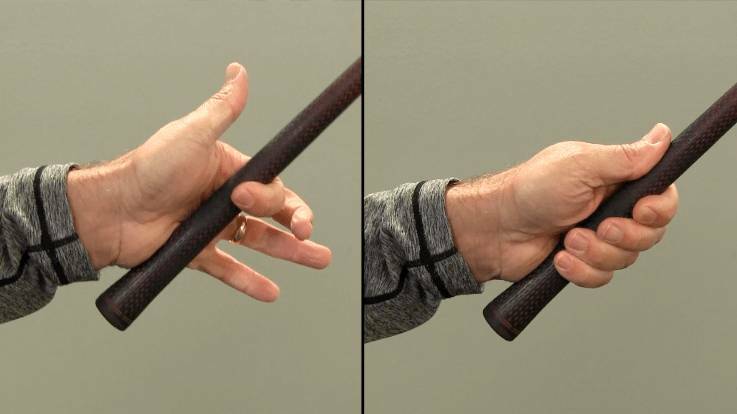 If you’re not sure if you’ve executed the grip correctly, test it by holding the club out in front of you. Release all your fingers except the index finger. If you feel the club balancing between your index finger and the pad of your hand, you’ve got the correct grip. You might also notice how easily your wrist hinges when you position the club this way. 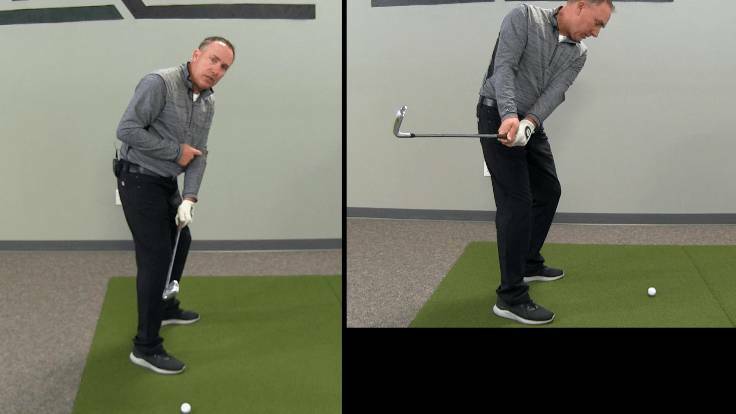 A lot of golfers refer to this as the “hinge mechanism,” and it’s another clear sign that your form is correct. Now that you’re holding your club in your fingers like a pro, take a look at your thumb. Is it extended along the club shaft? If you’re like most beginner golfers, it probably is. This is what I call “long thumb,” and it’s an error that has multiple consequences. 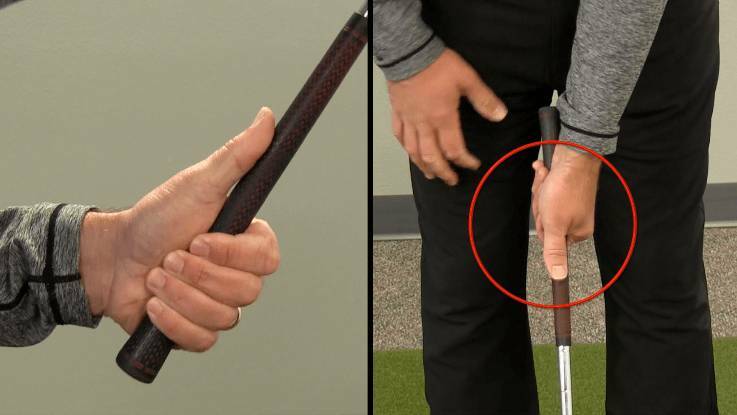 Most significantly, a long thumb will sabotage you on the backswing. You see, at the top of your swing, the club wants to drop. You don’t want it do that, but a long thumb will let it happen. Keep the knuckle at the base of your thumb bent just a little. This shortens the thumb and creates a natural breaking mechanism at the top of your swing. When gravity conspires against you and the clubhead wants to drop, your short thumb will keep everything in place. What I refer to as “pressure,” you may think of as “weight.” Either way, we’re talking about how you position the force of your body in your feet. When most new golfers step up to the ball, instinct tells them to focus more pressure on the trail foot. This comes from the impulse to put as much power as possible behind the ball so they can lift it up. However, the best way to power up for your shot is to build momentum, and for that, you want to start with your pressure forward. Ideally, you want what we refer to as “60/40 pressure.” That’s 55-60% of your pressure on the lead foot and 40-45% on the trail foot. You want there to be an “unweighting” when you start your backswing. “Unweighting” refers to a shift in pressure between your lead foot and trail foot. As you swing back, you transfer pressure from the lead foot to the trail foot. By shifting pressure, you build up momentum to pack more power into your swing when you bring the clubhead back through. If you start with more pressure on the trail foot, you can’t make that shift. Your technique on the takeaway can make or break your shot. 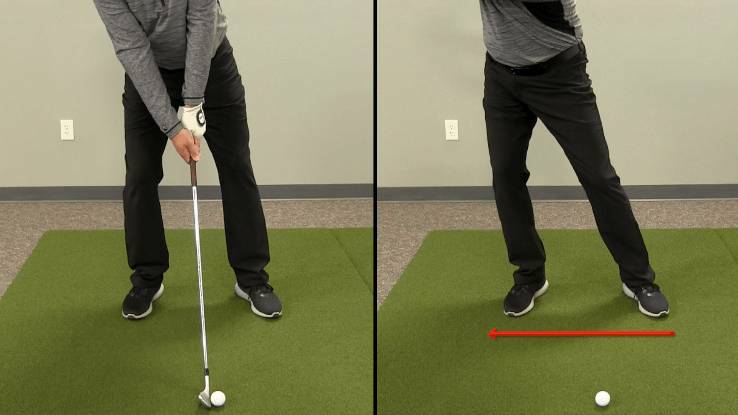 If you get the club moving away from the ball correctly, you set yourself up for a solid golf swing. However, if you compromise your form on the takeaway, you’ll the see consequences in your ball flight. One very common habit among beginners is to slide their hips away from the ball. 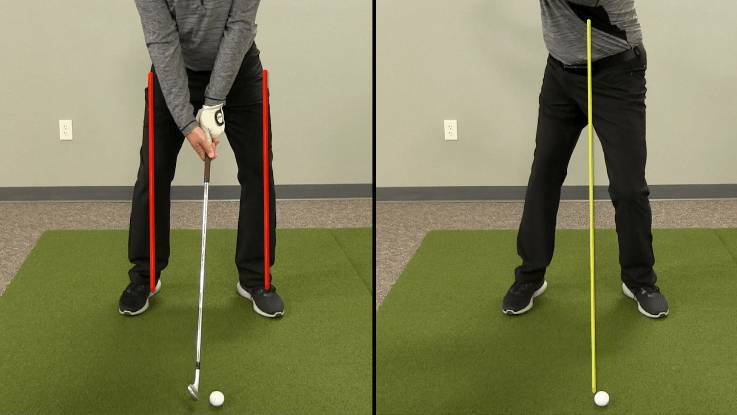 Unfortunately, shifting your hips is a good way to ensure you make a poor shot. When you initiate the movement of your swing, feel your body pivot and turn into your right (trail) heel. Think about moving the right pocket of your pants back. You should feel the trail leg release a little. This pivoting motion is where you see the payoff of that 60/40 pressure balance. You’ll be able to shift pressure from the lead foot to the trail foot as you turn into it, building the momentum you need. 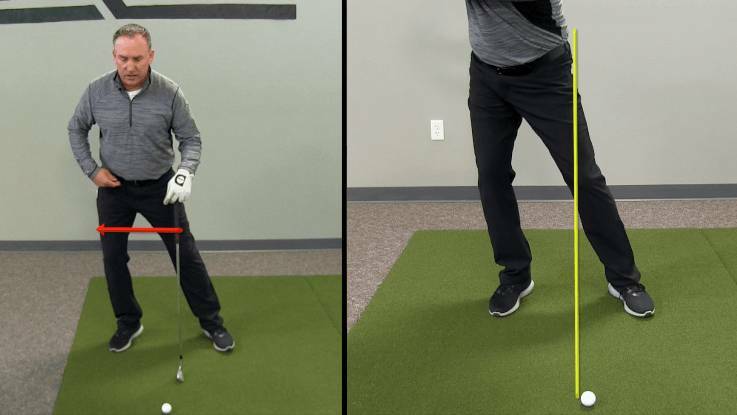 Here’s a great demonstration on foot pressure with Swing Catalyst. Notice what your lead arm does during that initial takeaway. Is it working out and away from the body? Many new golfers fall into the trap of bringing the lead arm away from the chest when they start their swing. This motion causes the clubface to rotate. If you’ve seen any of our videos or articles on setup, you know how crucial it is to square the clubface to the ball. You know about positioning your club to make the most of the loft built into your clubhead. Well, if your clubface rotates on the takeaway, all the work you put into creating a perfect setup is undone. Your odds of finding that perfect positioning again at the moment of impact have gone way, way down. 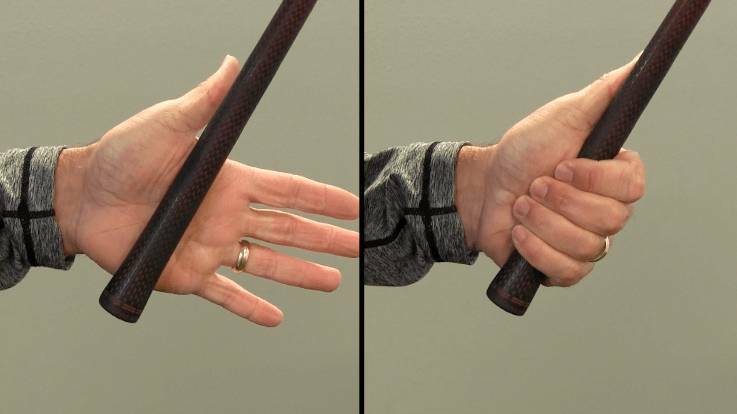 Grip: Hold the club in your fingers. 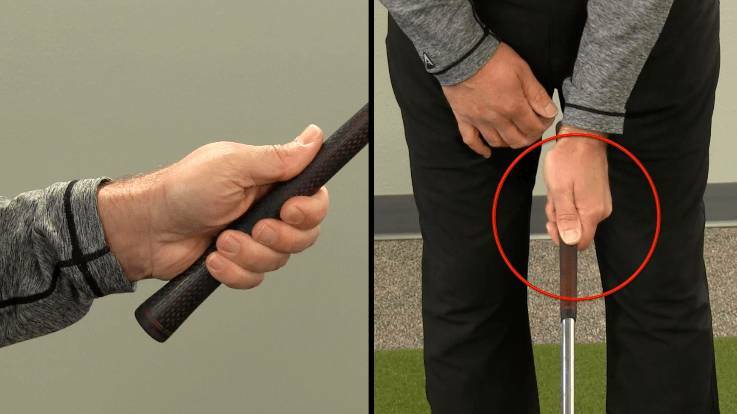 Grip: Keep the thumb short along the club shaft. Setup: Focus more pressure on the lead foot, with a 60/40 distribution. Takeaway: Pivot into the heel of your trail foot. Takeaway: Work the lead arm into the chest, keeping the clubface square to the ball. When you have all of these elements in place, you will start to see significant improvements in your game. Now, let’s talk about how you can turn these helpful tips into actual habits. Understanding the concepts for beginner golfers is one thing. Making them a natural and consistent part of your game is another. The key to turning knowledge into habit is practice. This drill will help you get these tips into your body. Use an 8-iron or a pitching wedge. Place the ball straight out from your lead foot. Put all your weight on the lead foot, touching only the toe of your trail foot on the ground behind you for balance. Take several golf shots balanced on that lead foot. Through this drill, your body is forced to learn to pivot rather than shift away from the ball. Believe it or not, when you have the pivot down, all these other elements tend to fall into place. Trust me. I use this drill with my beginner golfers all the time, and we are never disappointed by the results. Even the tour pros run this drill regularly. It’s a reliable technique for maintaining the kind of motion that keeps your game sharp, no matter your skill level. Now I want to hear from you. Which of these beginner habits have you discovered in your own game? Did these tips work for you? Have you tried the drill? Let us know what you think in the comments! We want to hear what has helped your game, what alternative tips you’ve heard, or what questions you have. We always welcome another opportunity to help you play better golf. Next post: The Skill Code by Cameron McCormick: Should You Try It?